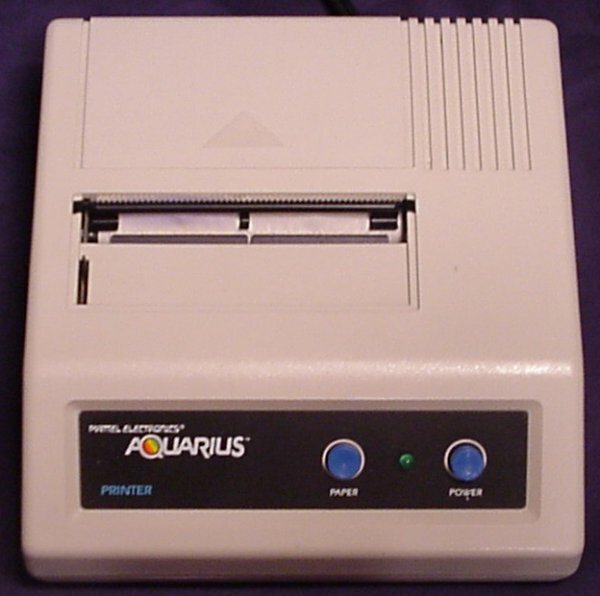 For ages, I have owned a mutilated Aquarius. Someone had cut the power cable. It was useless. But now a full-featured Aquarius system has been donated to the Museum. It's tempting to look at something from Mattel as being just a toy. 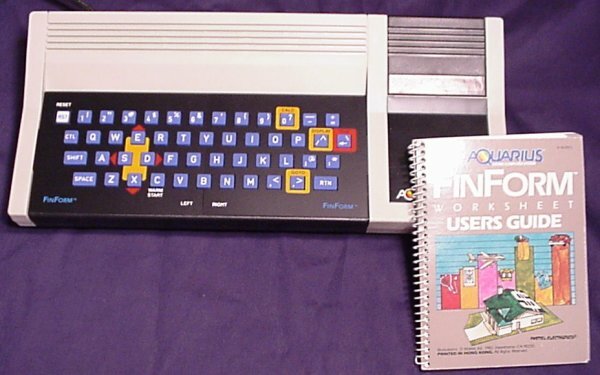 By itself, the main unit does indeed look like a toy, what with its blue rubber keys and white plastic body. But you would be missing the cool little printer. And the funky cartridge port, suitable for both program carts as well as memory expansion. And while the rubber keys are not fun on which to type, they do allow room for custom templates to fit over the keyboard, depending on the current task. 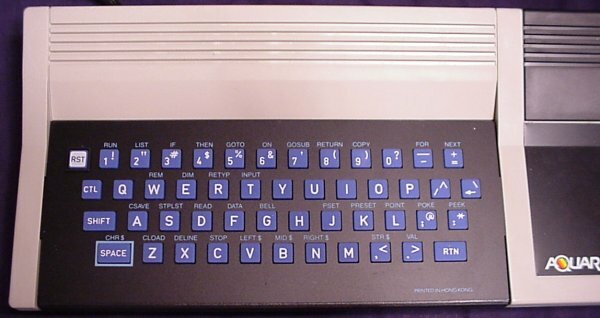 Here's keyboard with the standard BASIC programming template in place. 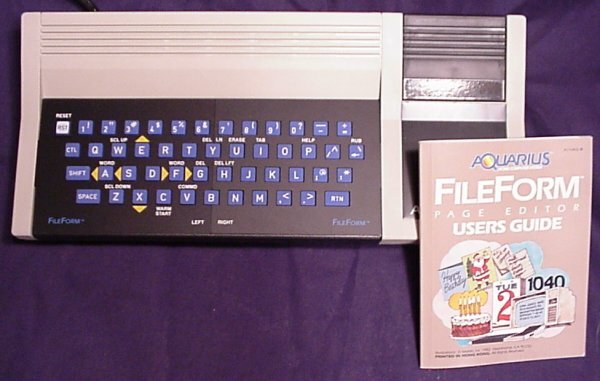 FileForm, the filing/word processing application. 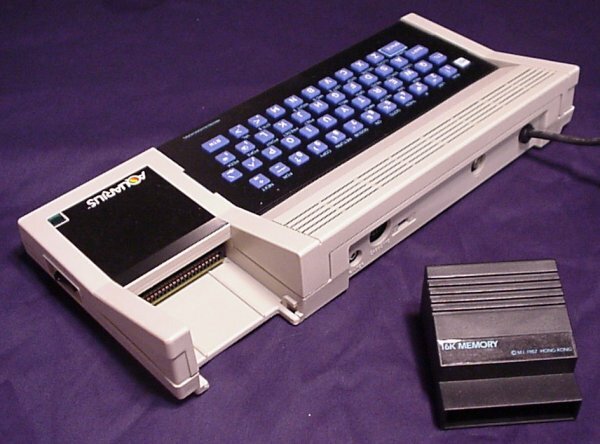 The actual program runs from the black cartridge plugged in at the upper right corner. Close-up of the FileForm template. The templates do sort of make up for the lack of cursor keys. FinForm, the financial/spreadsheet application. Another cart. Close-up of the FinForm template. Not quite as much to this one. 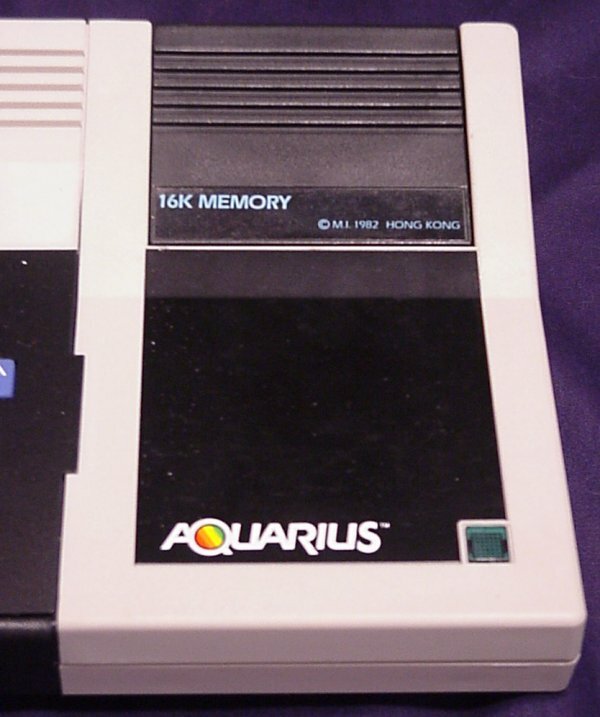 Here's the memory cartridge plugged into place. As far as I know, there's no way to use a program cart at the same time. Backside of the unit, showing the cartridge port. There's a black shell that fits in the port when you're not using a cart. Also shows the standard audio/video and RF outputs. Teeny little thermal printer. Despite the way the photo looks, it's actual the same brilliant white as the main unit. Click here to view all comments for the Mattel Aquarius and to leave your own. Click here to view comments about other Mattel computers.